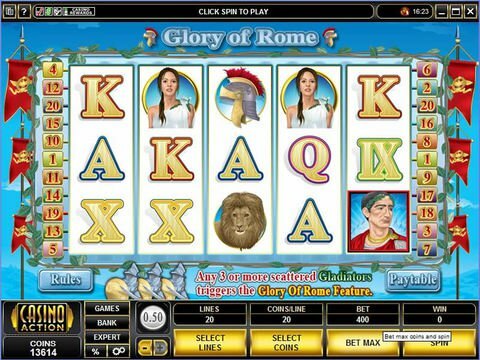 Glory of Rome makes you think of when Rome was THE power in the world and you will feel like an emperor if you win the maximum cash jackpot of $50,000. There are 5 reels and 20 paylines and on a single spin and the betting range per spin is a big one with 1 cent being the minimum bet and $200 being the maximum bet. Looking for a site that offers free slots games without downloading any software? You've come to the right place. The game has a wild and scatter symbol, a multiplier, a bonus game, and free spins. The symbols you will see playing Glory of Rome are Caesar, gladiators, chariots, lions, soldiers helmets, IX, X, Jack, Queen, King and Ace. Caesar is the wild symbol and besides the gladiator scatter it can be used to substitute any other symbol to give you a winning combination. One cool thing is that when the wild does complete a win Caesar will wave to the crowd. Spinning on 3 or more of the gladiator symbol will trigger the bonus game. Right away you are awarded 8 free spins and then you get to pick between 4 and 9 shields. Each of the shields has a payout of 8 times your triggering bet or 8 more free spins. In all the free spins you make the wins are automatically doubled. The demo mode of the free slot game from Microgaming will allow you to play for free without making a real money deposit and if you want to use the autospin feature all you have to do is click on the expert mode button, which is located at the bottom of the screen just to the left of the 3 betting control buttons. One of the betting control buttons is the Bet Max, which you have to click in order to win the top cash payout. One solid online casino that allows Canadian players to enjoy the action is All Slots Casino. They offer Canadians 100% up to $500 to play with some free cash.